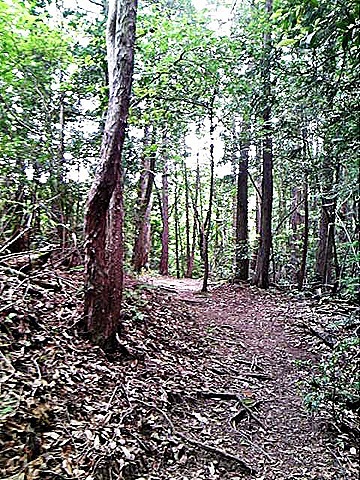 Kaisho-No-Mori Forest : "Where am I?" —"I don’t know." 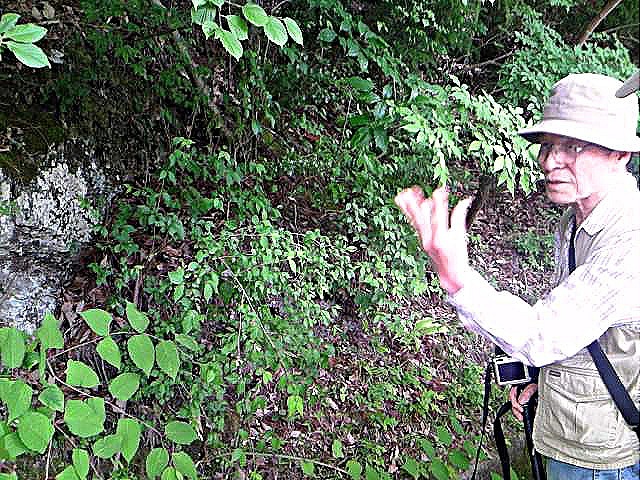 “That is Shiro-ito-so (Chionographis japonica).” I turned around and found a man standing behind me and pointing the delicate flower. “It’s my first time to see the plant,” I replied. 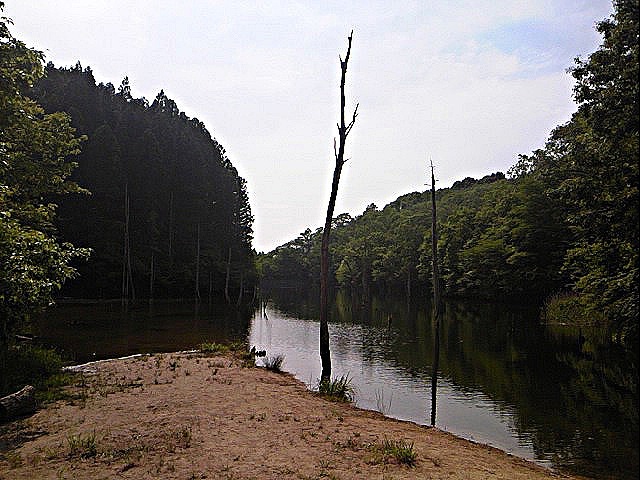 I was at the entrance of a forest called Kaisho-No-Mori in Seto on the afternoon of May 26. Actually I had been there before (http://wp.me/p16bjt-V), but I didn’t remember the flower. I was being impressed by his knowledge when the man started explaining about other plants. He is a member of a support group for the forest. “It’s dangerous to come down when you’re lost in the forest. Mmm…I’ve heard of that…but I’m now doing that…” I thought that to myself when I was walking. Strangely I smelt something sweet like pudding on the way. “Pudding! Pudding! Pudding!” I was chanting the word to encourage myself and kept coming down through the pathless route. Luckily I did not lose the sense of direction and was sure I could come out of the forest to somewhere proper path. But I felt lonely. 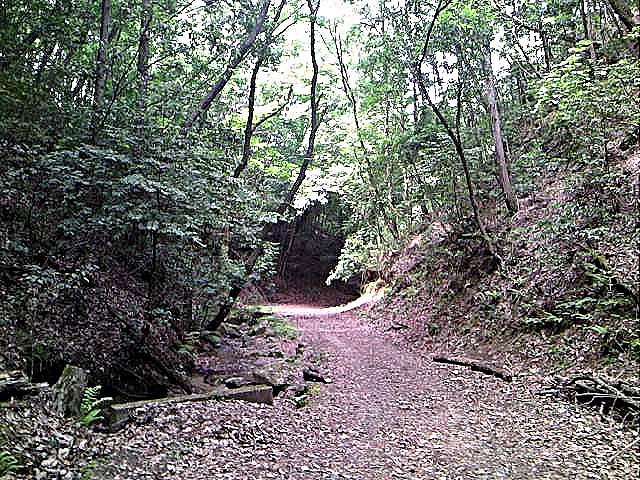 Kaisho-No-Mori Forest is in Seto, which is located northeast of Nagoya and is famous for ceramics, and once was a candidate site for Expo in 2005. But there was a big protest movement against the construction with supporters of environmentalism and an endangered bird was found there during the campaign. So the plan as the Expo site was abandoned and the forest was saved. 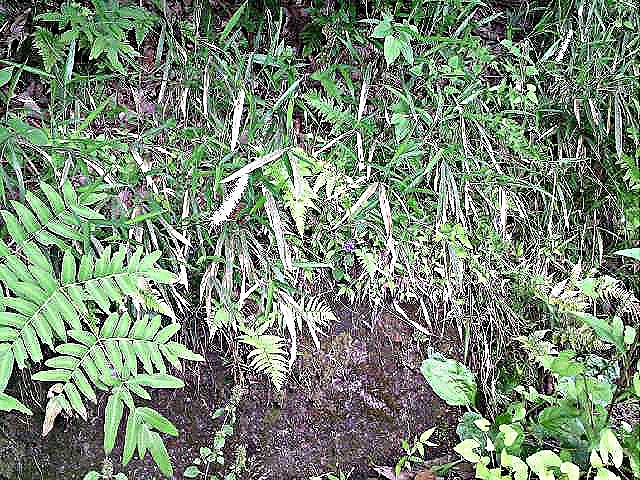 Actually the forest was almost destroyed in the high economic growth era, but many trees were planted later and the forest looks like “a forest” now. 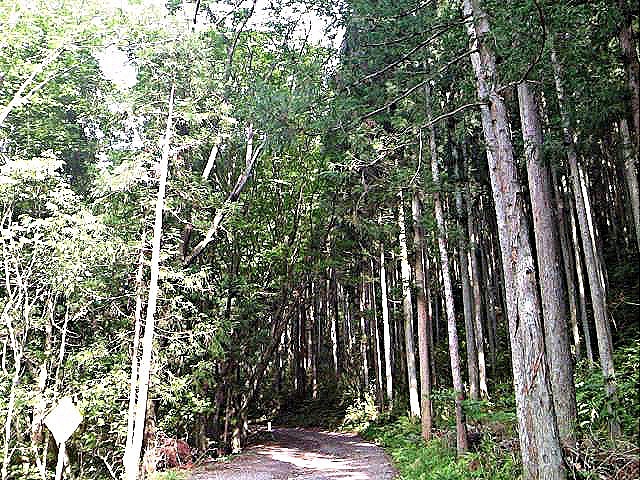 Nevertheless, Kaisho-No-Mori Forest is a quiet and peaceful place to which it is easy to access from Nagoya. You can enjoy fresh air, see wild flowers, and hear birds’ songs there getting away from hustle and bustle of a city life. I had a great time, too! Oh, I have an advice. When you enter the forest, you should go with a guide. 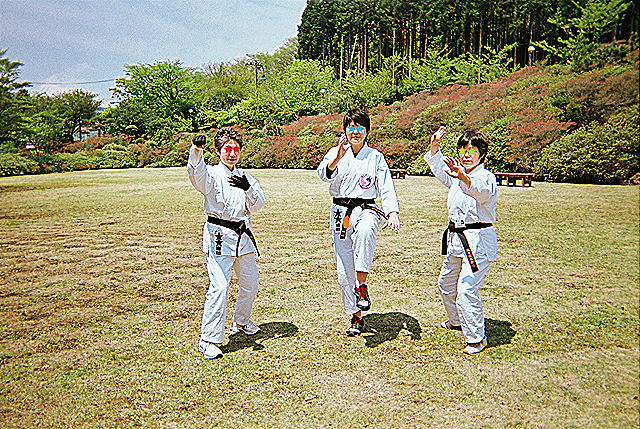 The Tai Chi Training Camp in Hakone 2012: "Are you coming?!" “Actually, we’re coming to Hakone, too. See you later.” Soon after Michipon texted Kiku-chan that, she got its return message of surprise: “Are you coming? !” That was on the train heading for Odawara. Michipon, Fusa-fusa and I were going to Hakone in Kanagawa Prefecture on the morning of May 6th. 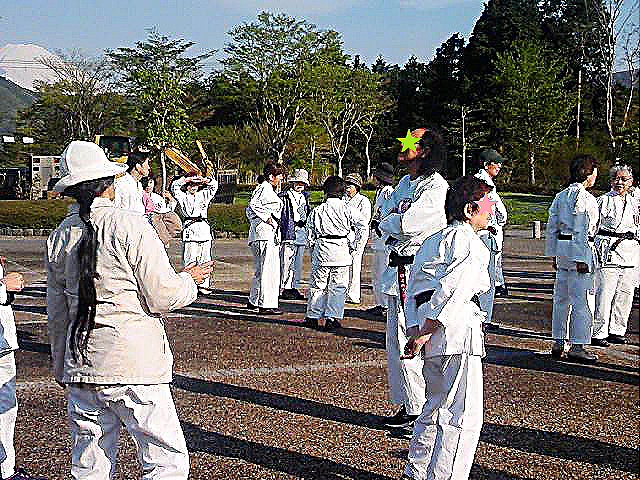 There is a Tai Chi training camp in Hakone on May 6th and 7th every year. 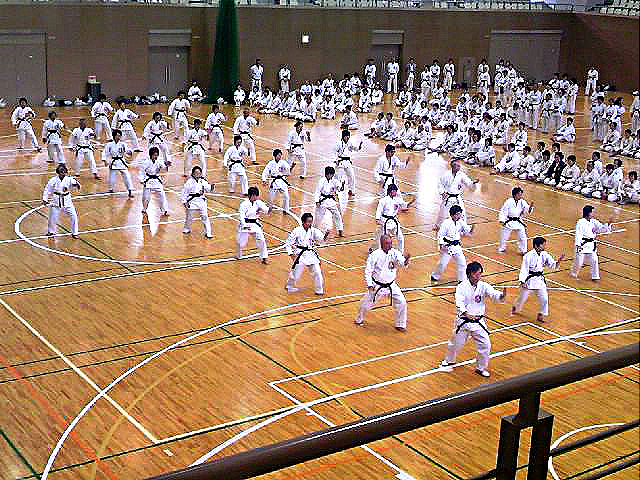 An examination for promotion to grand master of Tai Chi is also held during the camp. Kiku-chan and his husband were going to take the test this year, and Michipon, Fusa-fusa and I were going there to encourage them. But we had not told them about that until Michipon texted Kiku-chan in the train that morning. We wanted to surprise them. But we became afraid that they might cancel the plan after getting on the train….That is why Michipon confirmed that by texting, and then revealed that we were also coming. At Odawara Station, Michipon, Fusa-fusa and I got on a bus. It was a usual city bus, but the inside of the car was probably unusual because it was jammed with people who were taking part in the Tai Chi training camp like us. Of course, the passenger sitting next to me was also a participant. Surprisingly, she came from Hokkaido! She was also taking the examination for being grand master of Tai Chi. Although it took nearly an hour to arrive at our destination from the station in the overcrowded cattle car, I had a great time talking to her about Hokkaido’s grand nature and Tai Chi. 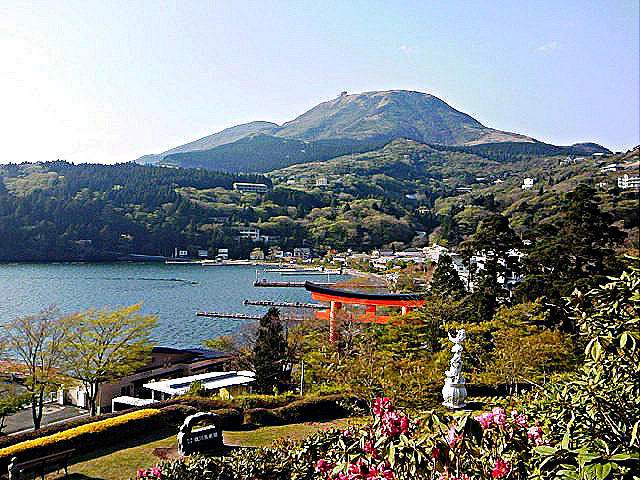 The training was held at a gymnasium named Lake Arena Hakone. About 350 people from all over Japan participated in the meeting this year. 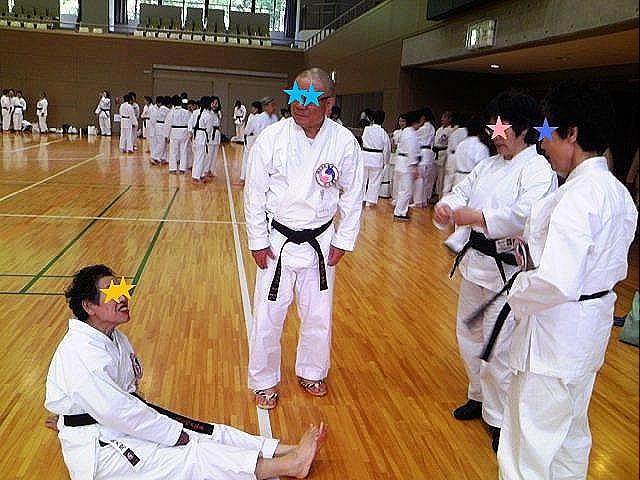 Kiku-chan cried out gratefully, “I’ve never heard someone take part in the training camp to encourage examinees!” when Michipon, Fusa-fusa and I met her at the gym. 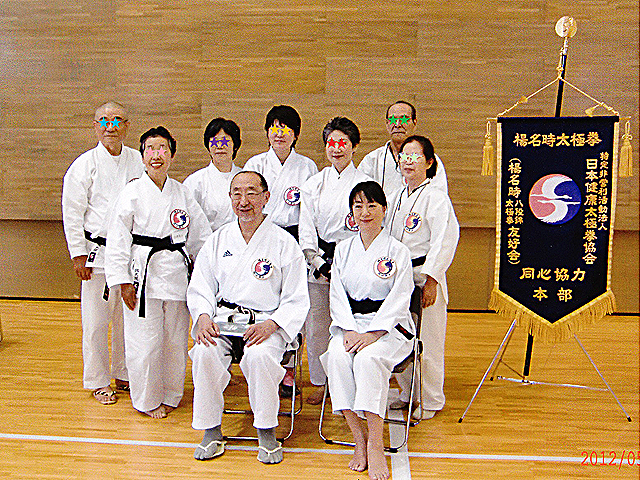 As you can see, all the participants are wearing the same martial arts uniform. It is because that is our formal wear in Yang Ming-Shi Tai Chi. We usually do Tai Chi in casual clothing such as T-shirt and stretch pants. But all the participants at the meeting had to wear the uniform. That is why, Kiku-chan bought the uniform to take the examination, and Michipon, Fusa-fusa and I bought ours to see her and her husband this time. It was a terrible weather that day. We had a thunder storm during the training at the gym. There was even a tornado in Ibaraki Prefecture and it killed a boy. But we went out the gymnasium after the meeting, the sky was getting clear up and we were able to see Mt. 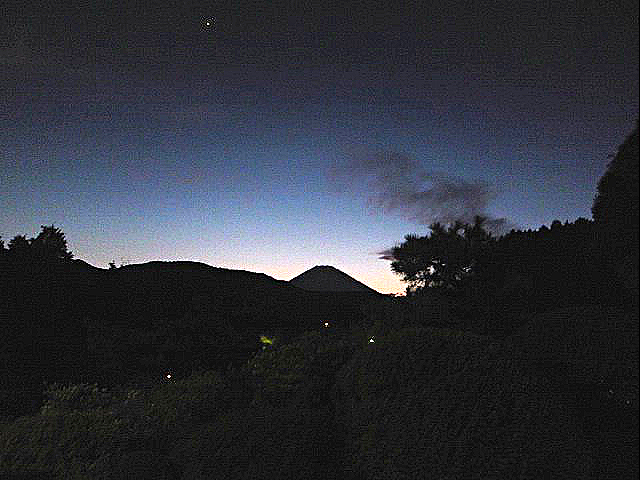 Fuji’s beautiful silhouette. I couldn’t take its marvelous figure with my phone camera, but the mountain was shinning silvery at night with a full moon. That was amazing. Next day, it was a beautiful day that it was hard to believe that we had a terrible storm on the previous day. We practiced Tai Chi at 6:30 in the morning under the blue sky hearing birds singing. We could see Mt. 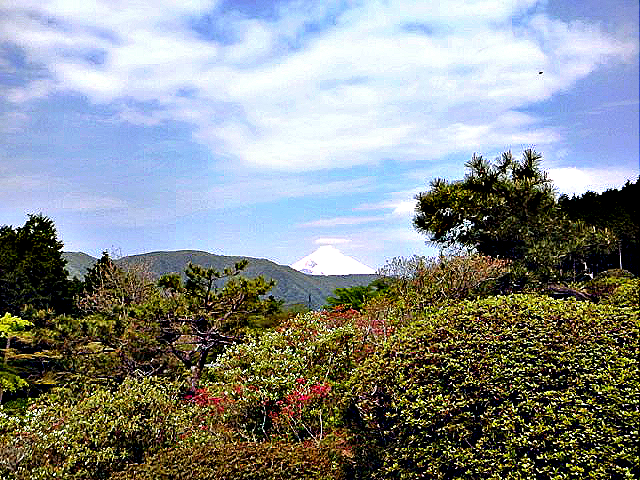 Fuji’s elegant and beautiful shape. Someone exclaimed with pleasure, “Nevertheless I’ve come here for more than 15 years, it’s the first time for me to see such a beautiful Mt. 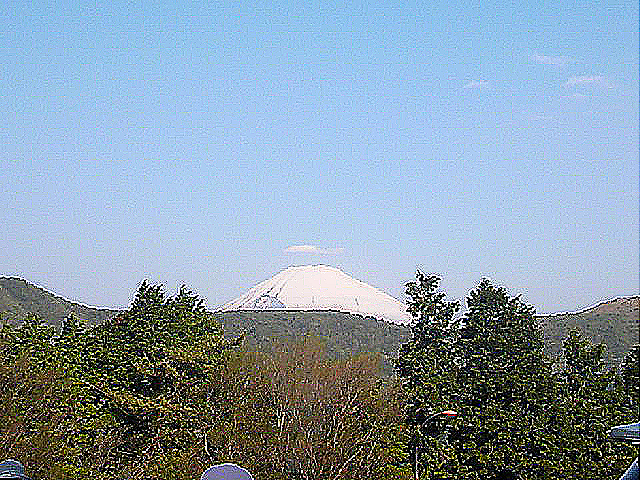 Fuji!” That is, I was very lucky. 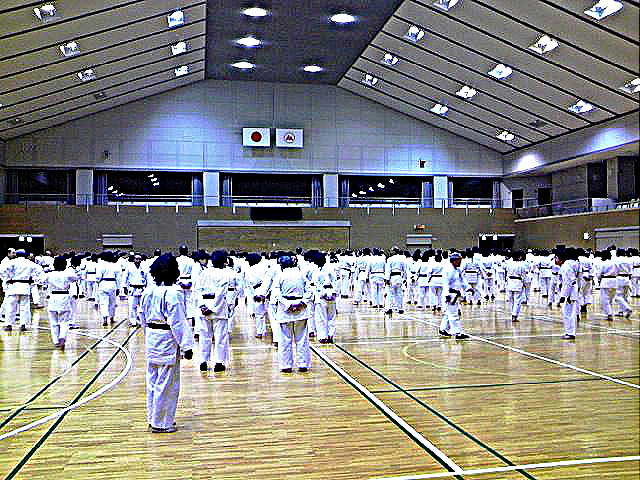 After breakfast, the examination for promotion to grand master of Tai Chi was held at the gymnasium. There were about 100 examinees this time and they were separated into three groups. The lady from Hokkaido was in group A, and Kiku-chan and her husband were in C. The room was filled with a feeling of tension. Only sound I heard was rustles of the performers’ costumes. And sometimes cameras’ shutter sounds…When the examination was over, it seemed that not only test-takers but also observers got relieved. Actually, people who did not take the test might be more nervous than the performers. I was very glad all of them passed the examination. Congratulations! Kiku-chan and her husband took Michipon, Fusa-fusa, and me to a museum called Narukawa Art Museum in Hakone after the training camp. 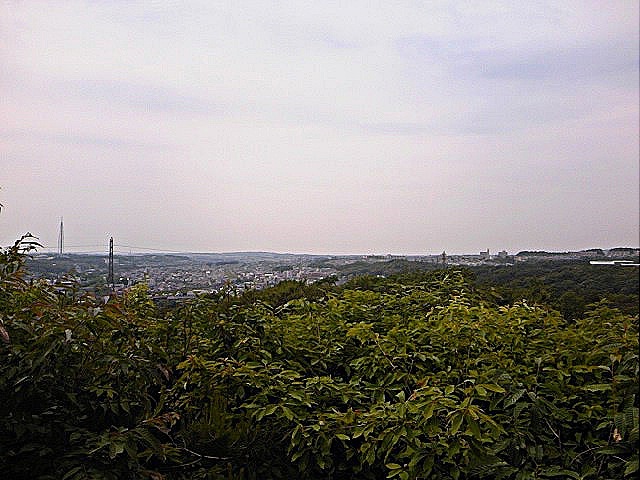 The museum is on the top of a hill, and you can enjoy not only its exhibits but also the view from the place. We appreciated wonderful modern Japanese paintings, and chattered over coffee and cake seeing a beautiful view from the café. I had a really great time with my friends. 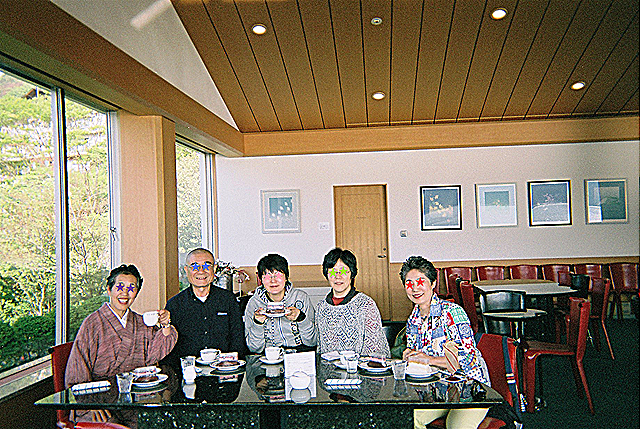 The trip to Hakone is going to be a cherished memory for me.